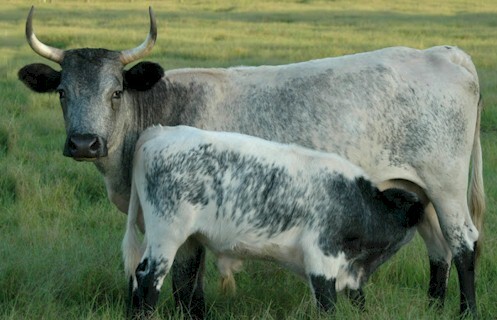 Florida Cracker cattle are one of the rarest and oldestrnbreeds of cattle in the United States. They descended from Spanish stockrnimported to the continent in the sixteenth century. Combination of the new lawsrnabout free-foaming livestock and the introduction of larger meat cattle breedsrnled to the rapid decline of the Florida Cracker cattle after 1949. The breed isrnstill listed as â€˜criticalâ€™ by the American Livestock Breeds Conservancy,rndespite the continued work of the Florida state government and a breedrnassociation. And the breed is listed on Slow Food USAâ€™s Ark of Taste. rnrnThey are smaller sized cattle and come in many colors. Theyrncan be dappled-grey/blue, dappled-brown, solid brown, solid white, white withrnbrown spots, white with black spots, all black or in some cases a pure goldenrnpalomino. Both cows and bulls usually have curved horns, and some animals arernalso polled.